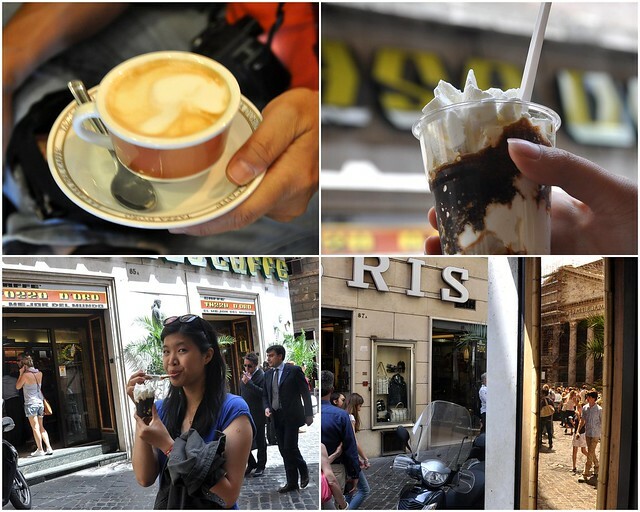 A Daily Obsession: Day 1 ROMA! We've come to the last city on my Euro tour: Rome, the mother of all European cities. The city that beats all other European cities in ancient buildings and structures, the city that you can never cover in one trip, the city that had a million inhabitants two thousands years ago and was bigger than any other city in Europe at that time. The city that I'll never get bored with. We met up with our daughter, who'd flown into Rome with her course mate Cheryl the day before, at the main train and metro station, Stazione Termini. I had never stayed in a hostel before (remember, this was in May, the earlier part of my travels) and expected dirty run-down rooms. It turned out that Camping Roma is a sprawling camp of small semi-D houses/campers, very clean and pleasant, set on a hill overlooking the city. There are lots of facilities, including a restaurant, tourist info desk where you can do all your travel bookings and buy entrance tickets, Internet room and bus services right at the door, including those buses that take you to the Vatican, 10 minutes away, and other places of interest, at discounted prices. The rooms are small but clean and if you're on a budget and staying long in Rome, this place is perfect. 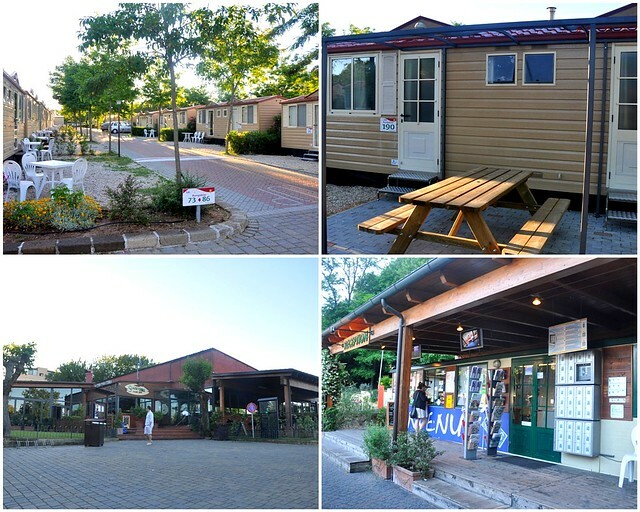 Book early because Camping Roma is very popular and well-known. A small family of four can fit into one house but that's rather claustrophobic and if you take two houses like we did, it's comfortable. Only 18 euros per person if you book early. Who says Europe is expensive. The next day, we started out early and went to the Colosseum. It was a blue-sky day and we melted! We got out of the metro station and the Colosseum was right in front of us, giving me the shivers and an unreal feeling like, am I really here? Cheryl and Yi were screaming and squealing, grabbing each other and jumping up and down. The Roman guys straightaway hit on the girls, telling them they were beautiful and asking them out, which happened a few times a day in Rome. The Italians are hot blooded Casanovas alright. When Yi/Cheryl asked a gelati guy what the best flavor was, he said "The kiss." 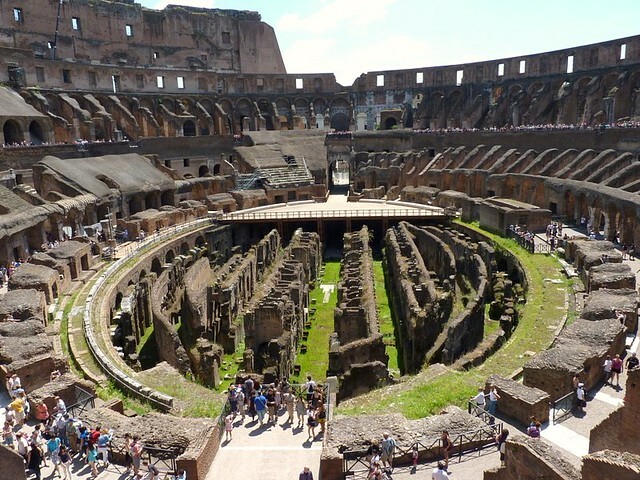 Much of the hypogeum, the 2-level underground, where the cages for animals and gladiators were kept waiting, is still intact. I kept thinking how cruel and inhuman the ancient Romans were, watching executions and humans being torn up by lions as a sport. Sick people. 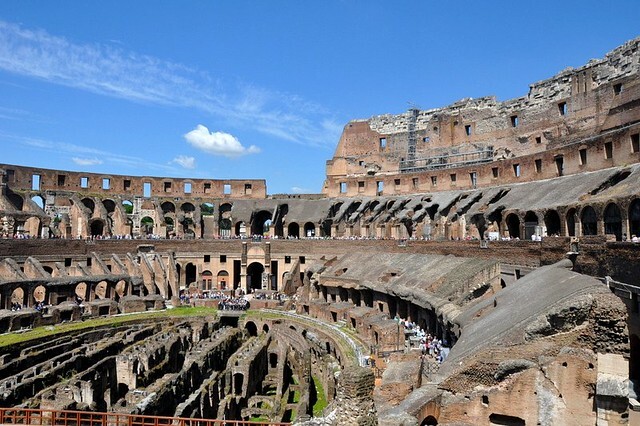 The Colosseum is awesome, a huge amphitheatre that could sit 50,000 spectators and still standing after nearly 2000 years. The building is so well planned that spectators could exit it within minutes because there are 80 exits/entrances. It was a happy happy day. The Forum, Roman ruins dating from the BCs when Romulus and Remus founded the city, is next to the Colosseum but it was just too open and hot to explore so we decided to walk to the city. 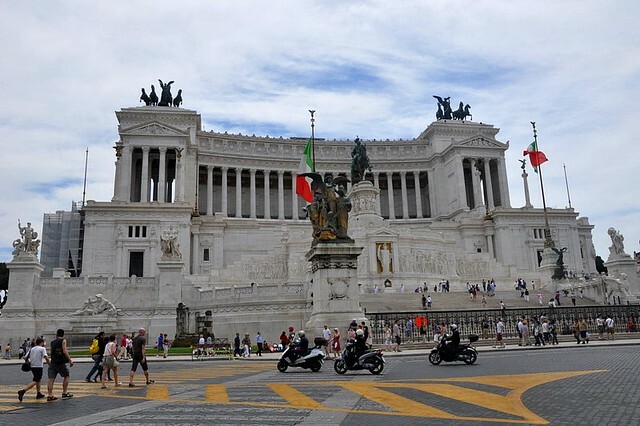 On the way, we passed the Roman parliament building. The parliament building is so huge and grand but it was burning hot, so we decided to skip it and walked on. A testimony to Rome's past glory is the size of the ancient buildings, all bigger and grander than my expectations. We got to the next big one, the Pantheon, and I was especially taken by this building because I'd read about it in history books and always wanted to see it, more than the Colosseum. 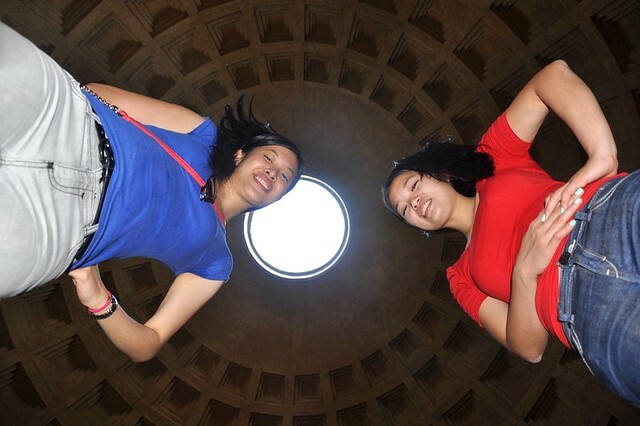 The girls of course squealed and jumped again when they saw the Pantheon. The Pantheon, always under repair. 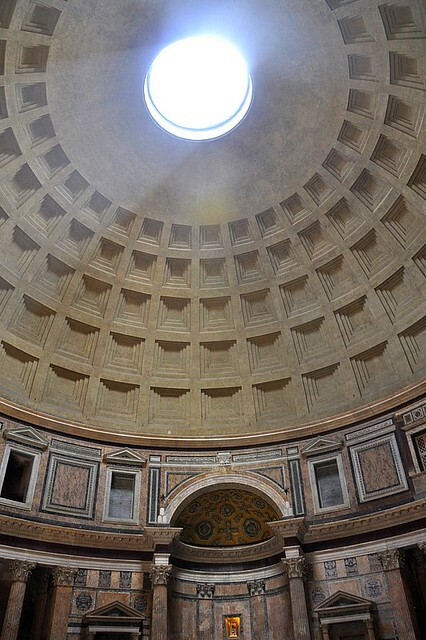 Given the limited tools at the time and the fact that such a large concrete dome of 43m/143 ft not reinforced by any steel members is still standing, the Pantheon is an amazing wonder. The words carved in the front of the building means "M. Agrippa, son of Lucius, in his third consulate, made it". Marcus Agrippa was Emperor Augustus' son-in-law. "Oh, look, the oculus!" I was glad I had two archi students around because they were more knowledgeable than me. 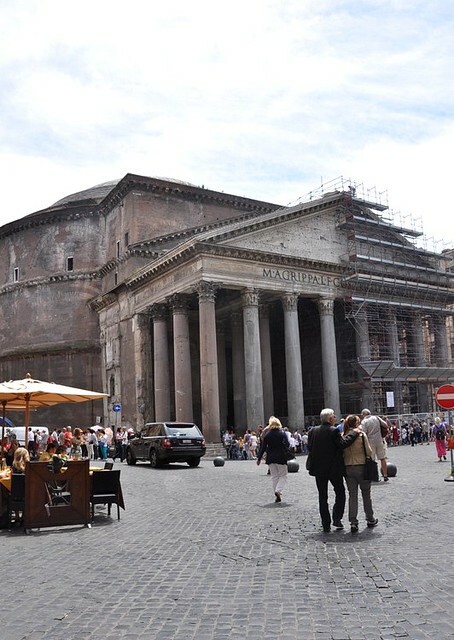 Originally built as a temple for all Gods in 126 AD (the first temple on the site was built in 27 BC but was burnt down), the Pantheon was turned into a church around 600 AD. It is sparse and beautiful inside and the oculus allows enough sunlight to light up the interiors. Amazing. I love the square panels on the interior of the dome. 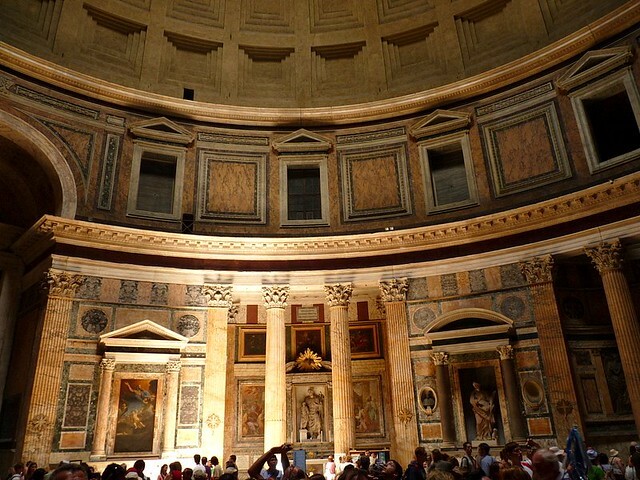 Many kings and emperors are entombed in the Pantheon but the painter and architect Raphael is the most famous resident and his tomb on the left of the rotunda was crowded with tourists. 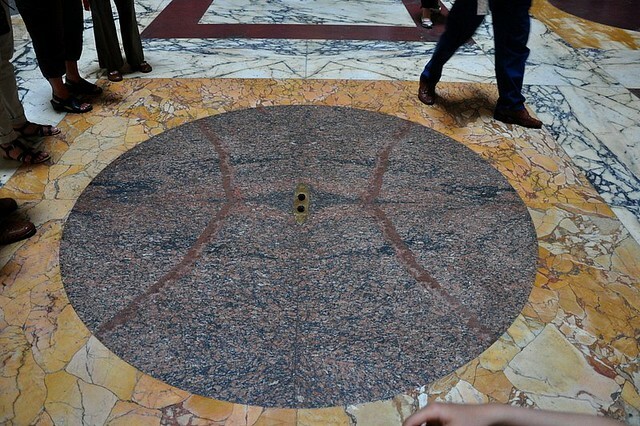 These two holes are probably the outlet for rain that comes into the Pantheon although I can't imagine how the water can discharge fast enough. The circle is right below the oculus. La Casa Del Caffe is a cafe on the front right side of the Pantheon recommended by Rick Steves for the coffee and granita de caffe con panna (coffee ice with cream), 2.50 euros each. Very strong and nice coffee flavor. You can see the Pantheon, in the bottom right photo, from inside the cafe or if you have super sharp eyes, you can see a flash of it in the movie Angels And Demons. After Rome, Angels And Demons was extra fun to watch because all the famous buildings were familiar and we had stood at the exact same spots in the Pantheon and the Vatican as the actors did. 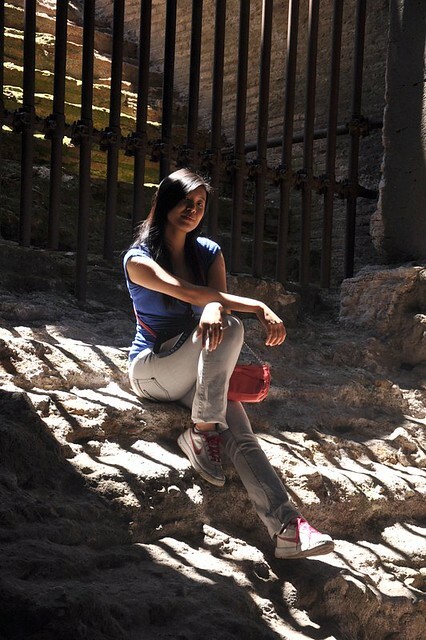 Ah~ Beautiful Rome! I am so going there too and one can never get too much of Italy. 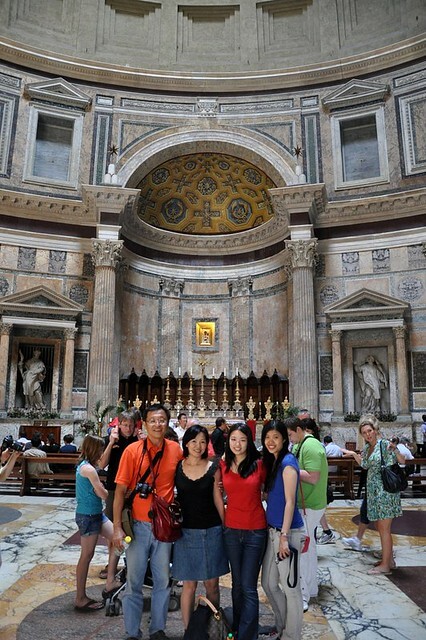 The photos are beautiful and yes, the Pantheon architecture is marvelous especially those square panels... beautifully designed and executed! i spotted your jumping shot! nice!! Oh yeah, I forgot to say, we totally enjoyed your blog entries! Please keep it the good work!! 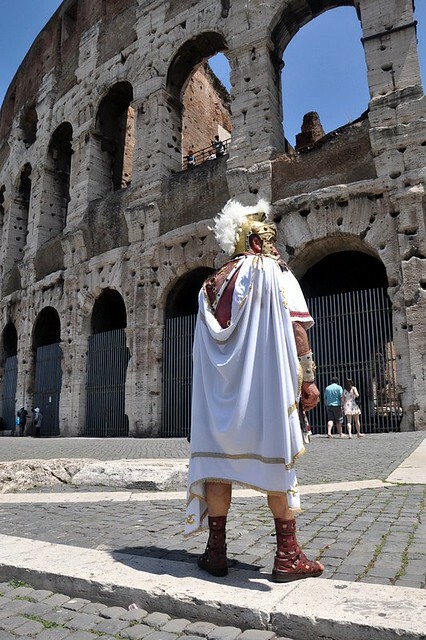 hh: oh you must go to rome! "all roads lead to rome" so you have to go there. yes, it's plus camping roma. they are very popular so book early. i think their rates can go down to about 15 euros per person, even for a 2 persons room. i prefer two persons in one room to a dorm bc there's so much privacy n you get your own toilet instead of sharing. also, my daughter had her painting stolen in our dorm n the management didn't do anything about tt. u must eat buffalo mozz, all the famous desserts n dishes, n all the gelati! oh i envy you! Hi Terri, thanks for your help. We still haven't decided where to go :D This million dollar question is so open that, i think we have a set of new destinations every 3 days!